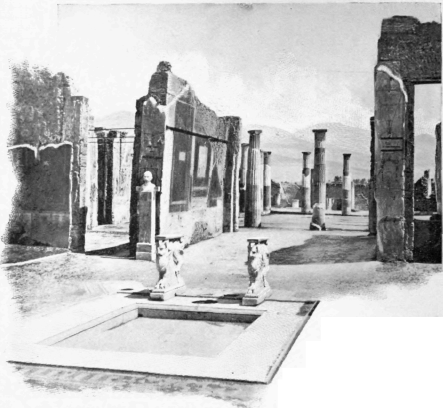 The dwellings of Pompeii were built in semi-Oriental style, and would, apparently, indicate that the climate of southern Italy was warmer then than now. Certainly one of the present Italian winters in these homes would be trying. A little distance from the door, the modern visitor invariably finds in every house a spacious court, surrounded on all sides by porticos. Unless an awning covered it, at least a portion of this court was always open to the sky, and in the centre was a marble basin, known as the impluvium, or receptacle for rain. In this, as in the Moorish courts of the Alhambra, a sweet-voiced fountain murmured day and night during the summer heat, lulling the inmates to repose. Beautiful flowers, also, frequently enclosed it, and from this perfumed courtyard the adjoining rooms received their light and air. What most surprised me was the wonderful preservation of the frescos. Although the finest have been removed to the Museum at Naples, those which remain are often exquisite in form and color; and, when first unearthed, they frequently appear entirely undimmed by their long burial of eighteen centuries. If a suitable roof were placed above them, they might last indefinitely; but Italy, alas, is spending too much money now on ironclads to lavish much upon Pompeii. Every excavated dwelling here has an individuality peculiar to itself. Thus, one was recognized as a physician's house, because of surgical instruments discovered there; another, was identified by the address of a letter found in its courtyard and deciphered; and many have been named from the bronze seals belonging to their owners. Among the objects taken from these houses and now preserved in the Museum are scales for weighing merchandise; dishes for cooking food; carpenters' planes and hammers; and, since the art of printing was then unknown, contracts and deeds engraved either on bronze or brass. 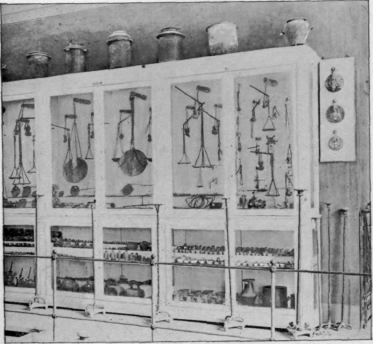 Here, too, are dentists' for-ceps; instruments of surgery, resembling those now in use; cosmetics also, rouge, curling tongs, and countless specimens of jewelry, - medallions, gold pins, bracelets, and magnificent cameos. It is plain, then, that every-day life has not so greatly changed in eighteen hundred years; for, in these old Pompeian homes, we even saw hot-air flues for heating baths, and water pipes of lead with just such joints in them as plumbers make to-day. 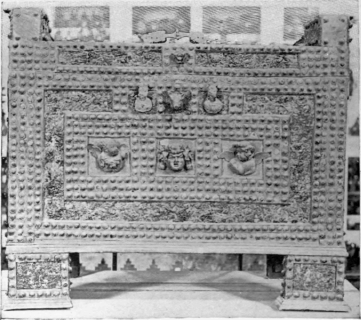 Another interesting relic is a money chest, made of thick bronze, with decorations still intact and beautiful. From its great size it may be supposed that its owner was a banker. At all events, this miniature safe-deposit vault was much too large and ponderous to be carried off by robbers; yet I observed that the locks were not particularly strong. Probably servants watched it night and day, and on the threshold of the house in which it was discovered was the mosaic of a ferocious monster, with the inscription, "Cave Canem". 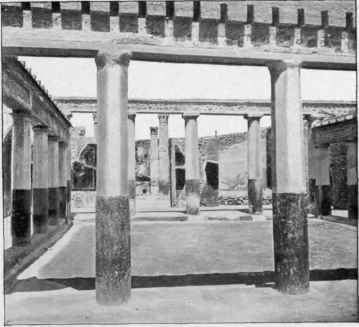 How beautiful these dwellings must have been, with courtyards separated from one another by graceful columns bright with varied colors, most prominent of which was "Pompeian red"! 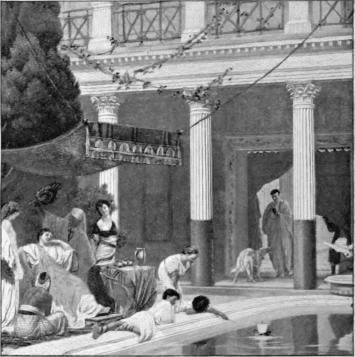 The walls, also, were peopled with fair forms in fresco, and marble statues of the gods gleamed white against a crimson background; from frescoed ceilings, too, hung the exquisite bronze lamps, hundreds of which have been found; and gilded couches were in part concealed by draperies from Tyre or Damascus; while the pavements, many of which are still uninjured, were always of mosaic. It is difficult to imagine anything more beautiful and durable in mural decorations than those which embellished the walls of these houses. 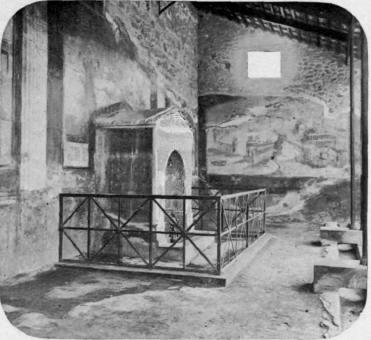 If their apartments had been lined, like ours, with perishable paper, or if the paintings which adorned them had been hung from wooden cornices by picture hooks, we should now know, by observation, little about the interiors of Pompeian residences. But all these walls were made of stucco, hard and smooth as marble, and were not only tastefully colored, but bore upon their tinted surfaces charming frescos, that have outlasted eighteen centuries of burial. In Pompeii every house, and almost every room, was decorated with frescos illustrating Greek mythology, in which by means of graceful lines and rich, harmonious coloring, gods, goddesses, bacchantes, fauns, and centaurs were multiplied in infinite variety. Hundreds of landscape paintings, also, have been found on these walls, portraying, as a rule, the scenery of the coast about the Bay of Naples and the villas there. In their inspection of Pompeii, visitors are usually accompanied by one or more soldiers; since, were they absent, nothing would be safe. Relic-hunting is a mania everywhere; but in this resurrected city the temptation to pilfer or destroy seems to be overpowering. It is a sad fact that throughout the world the finest works of human genius and the most sacred memorials of history are not spared by man. 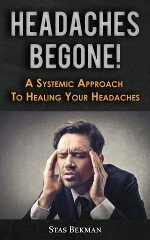 Let but an earthquake or the lightning's bolt give one of them a blow, and there will speedily arrive vandals to desecrate the injured form, and, finally, relic-hunters like vultures to pick its bones. 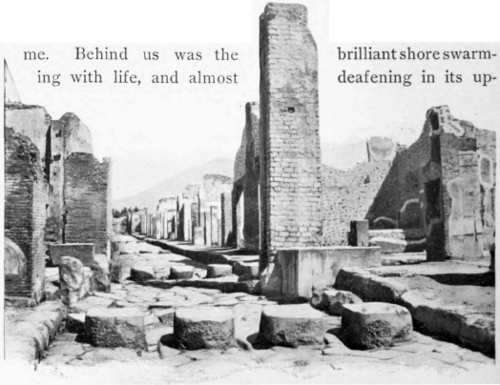 Why is it that we have Pompeii to-day? Because for centuries Vesuvius hid it from the sight of man.